Paella is a Valencian rice dish. 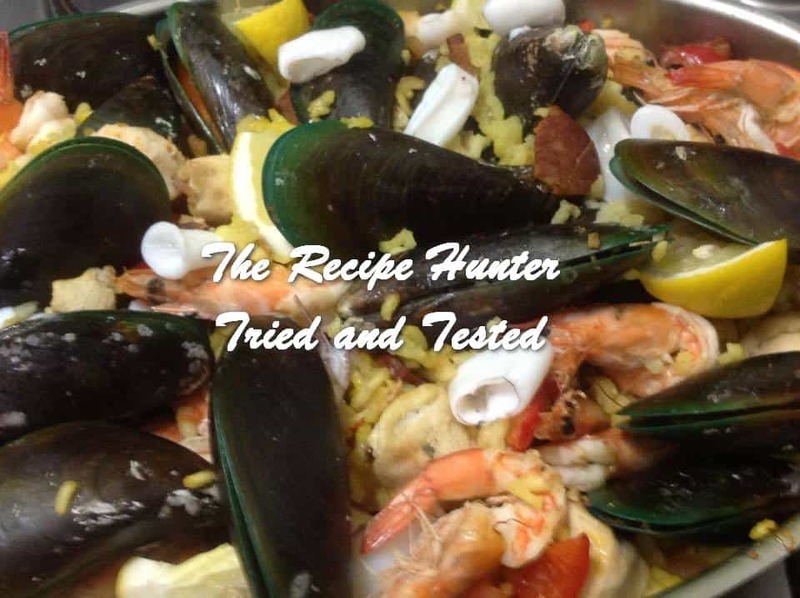 Paella has ancient roots, but its modern form originated in the mid-19th century near the Albufera lagoon on the east coast of Spain adjacent to the city of Valencia. 1 Litre of chicken stock with a few strands of saffron added. A piece of Chorizo about 150 gm sliced and quartered. Cook Chorizo in tbsp Olive Oil until lightly browned add chopped onion and cook for 2 mins. Put in dish and leave on one side. Lightly Brown Chicken in remaining oil and put on one side. Cook cubed red pepper, chilli, garlic until softened. and put in a dish on one side. Add rice to the pan and stir to cover with remaining oil (can add peas at this point) and add stock cook on rolling simmer 5-10mins or until rice has nearly absorbed all liquid. Add chicken and either continue to cook on the hob or put in the oven on 180C. Check and top up with water or stock if required if rice is too dry for 20 mins. Add Chorizo and Pepper mix cook for further 10 mins checking and stirring or topping up stock if required. Add Prawns and cook for further 10 mins. Add Mussels and cook another 8-10 mins until open. Add squid for last 3 mins of cooking. Squeeze over lemon and garnish with lemon slices or quarters and if you have parsley in the fridge add some chopped as a garnish. If rice still has not absorbed all the stock I cook of on top of stove until absorbed. Then serve, this is very much a recipe where the amount of stock depends on rice absorption and also what meat or fish you have. If I have some to use or in the freezer then I might add or use chicken thighs instead of breast. The mussels we got yesterday were quite big so we steamed before adding to Paella or if I have just shelled Mussels I stir through. So really anything goes just use your imagination, as you make more you will learn how to adjust to your own taste and once initial prep is done it is quite easy to make…enjoy experimenting. It can also be cooked on a BBQ and then you get that lovely crust the Spanish call socarrat, on the bottom of the pan.